If I did not dedicate a page of this blog to my favourite player, who was also one of the best players of the 90s, I feel that I would not be fair to myself. 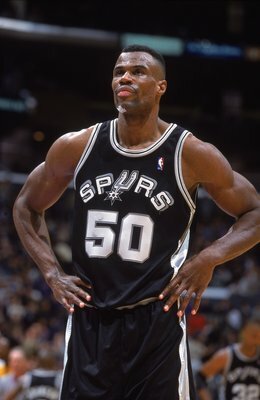 So, this page is dedicated to David Robinson; the player that made me a Spurs fan for life. I will try trough a series of short articles to capture his NBA career and say a few words about his pre-NBA and post-NBA life. I consider David Robinson, ‘the Admiral’ as his nickname was, one of the most misrepresented and underestimated NBA centers ever. I hope that I will be able to show to all of you why he was one of the greatest of the 90s and I hope that I will do him and his extraordinary NBA career justice. Have to agree – Admiral made me a fan! Like your site. Thanks man. Great post on ‘the Admiral’ he was not the average NBA player in any respect.